Tapioca starch or tapioca powder is used in many African meals. 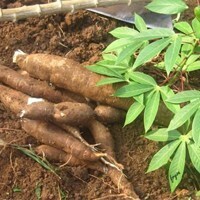 Extracted from the cassava root, it is both used for its taste and for its properties on skin. Tapioca starch originates from South America, but can also be found in Asia and in Africa, specifically in Nigeria. It can be found in the African Great Green Wall. Tapioca starch has a natural effect on oily skin and is perfect to mattify and to absorb sebum in order to smooth the skin and tighten the pores.